The saying goes, “Once a Jeanne d’ Arcer, always a Jeanne d’ Arcer!” Once you have spent time at Camp Jeanne d’Arc your blood runs blue and white! Of course time passes and we lose touch with our camp family. Well, we want to help you stay connected! Here are some ways to stay connected with your Camp Jeanne d’Arc family. Every spring and fall we publish an issue of Blue Sparks, our camp newsletter. 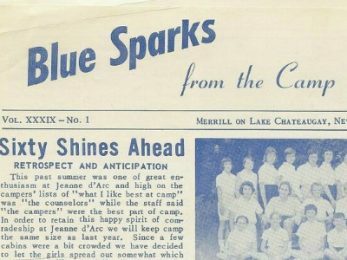 Blue Sparks will keep you up-to-date on all camp matters. In fact, we’d love to feature you and your noteworthy news and unforgettable photos in the next issue of Blue Sparks! You may also update your contact info as well. Check out our most recent issue of Blue Sparks! 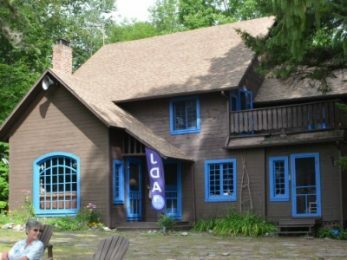 Camp Jeanne d’Arc hosts an official Camp Jeanne d’Arc Facebook page, as well as a JDA Alumni site. 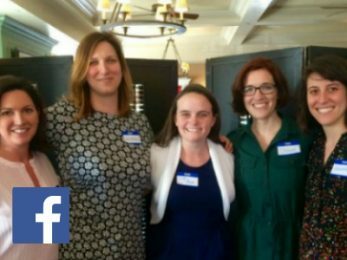 Our Facebook pages are a great way to stay in tune with the day-to-day happenings at camp and details about upcoming reunions and get-togethers. Want to host a reunion of your own? Send us the info and we’ll spread the word. Come to camp for a visit! There is nothing better than having our JDA alumni visit during the summer! Of course we’ll put you to work (and we appreciate your help)! There are projects fit for everybody, from teaching a “choice activity” to cleaning out the play closet; we could always use the help! Please read our Alumni Visitor Guidelines and let us know what kind of visit you would like to make. Take a stroll down memory lane with Colonel and the Camp Jeanne d’Arc Campfire songs. 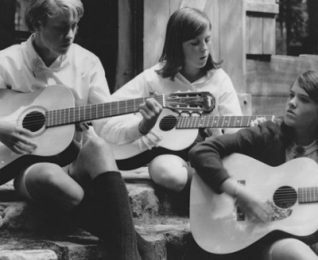 Interested in Hosting Your Own Camp Jeanne d’Arc Reunion? Provide us the details of date, time and location and we’ll spread the word on social media!